We've been looking at a lot of smaller enclosures lately, but some of you have pointed out, and probably correctly, that these Micro-ATX towers still aren't particularly small. They're smaller than the full ATX and super ATX monsters we've reviewed and certainly you could fit about thirty of them inside Corsair's gargantuan Obsidian 900D, but what if you want to go smaller? 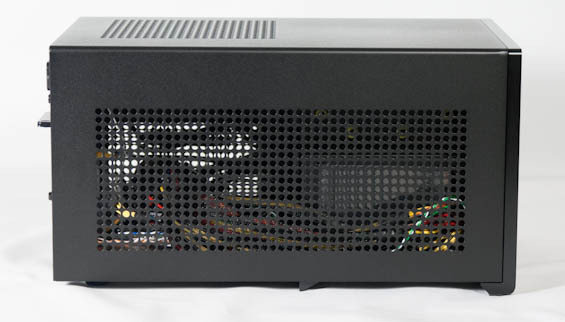 The BitFenix Prodigy is a popular option, but it's also on the large side for a Mini-ITX build. As it turns out, SilverStone takes their small form factor designs pretty seriously. 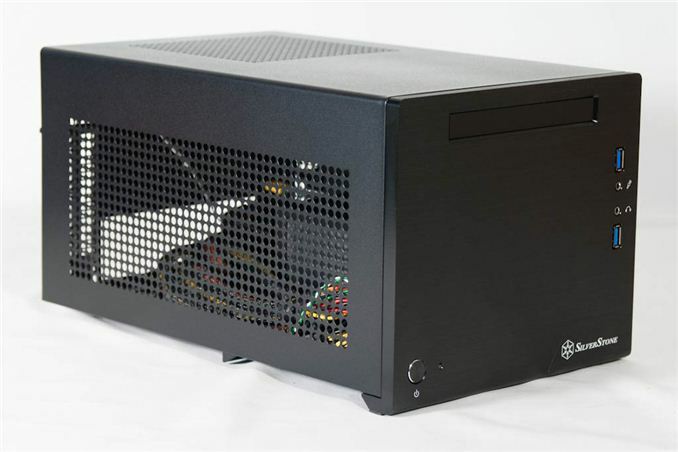 The Sugo SG09 we reviewed is a Micro-ATX case with roughly the same volume as the Prodigy, but how small can we go without sacrificing too much performance? The Sugo SG05 was a good start, but for those of you looking for a little more horsepower, the enclosure we have on tap today may be the way to go. The SilverStone Sugo SG08 is deeper than the SG05, but it also has superior performance potential. Those of you who've been paying attention may notice the top-mounted fan as being similar to Thermaltake's design in the Armor A30, but SilverStone is opting for an intake here instead. Since liquid cooling and tower coolers aren't really an option in the SG08, SilverStone has to take slightly more drastic measures, resulting in a very different design from the more basic SG05. If you have performance Mini-ITX on the brain, the SG08 could be promising indeed. Internal 2x 2.5", 1x 3.5"
Dimensions 8.8" x 13.9" x 7.5"
I'll admit I was a little taken aback by the price tag on the Sugo SG08, but try to keep in mind that you're getting a solid 600-watt power supply specially designed for the enclosure with it. I won't say it's impossible for you to run into the limits of this PSU in an enclosure like the SG08, just keep in mind that you'd have to overclock the absolute daylights out of your CPU and put in an AMD Radeon HD 7990 just to get close. When you get to an enclosure this small, though, you're definitely going to be making some sacrifices. Storage space is at a premium, but more enterprising users may opt to use an adapter to turn the 3.5" bay into a dual 2.5" bay, giving you space for four 2.5" drives. The slimline optical bay might have been a bigger deal in years past, but the larger PC industry has been gradually migrating to these drives, and a slimline DVD burner can be had for around $20 now. Honestly the worst thing about this bay could very well just be the freakishly tiny screws. Thanks for the review! Fitting a 117mm HSF seems so strange, when 120mm could have accommodated for so many more. I've been trying to decide lately on a new build that I need to be portable. I'm aiming to fit something like a GTX 660 or smaller in it, and trying to decide between a Silverstone Sugo SG05 or the Fractal Design Node 304. Any opinions? I think it's worth a mention that Silverstone somewhat recently released the SG05-LITE in white and black. It's SG05, but they don't include the SFX power supply, and it sells for $40 (!) on Newegg. I don't know of any other differences.